Just 3 weeks until school starts! We've been doing the usual back to school prep - getting haircuts, buying new clothes and backpacks, etc. I've also managed to find some time to create brand new printable lunch notes for the new school year. 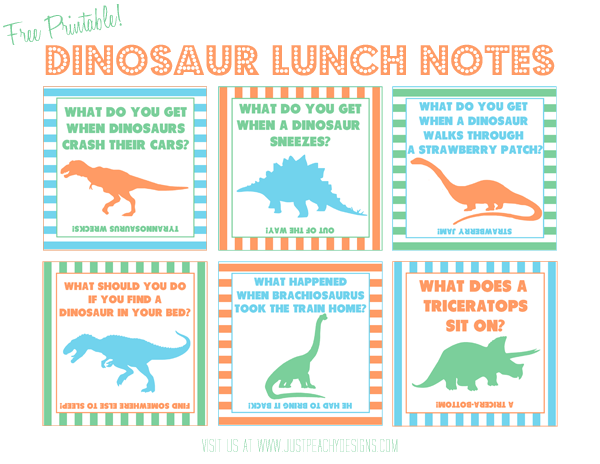 Here are some silly dinosaur jokes that I hope my soon-to-be first grader will get a kick out of. Maybe your kids will too! Just click on the image above to download. Enjoy! I'm sorry you're unable to print. I'm really not sure what the problem could be. I always print my stuff at Fedex Office and these printed out just fine. Maybe there is an issue with your printer? Sorry I can't be of more help!